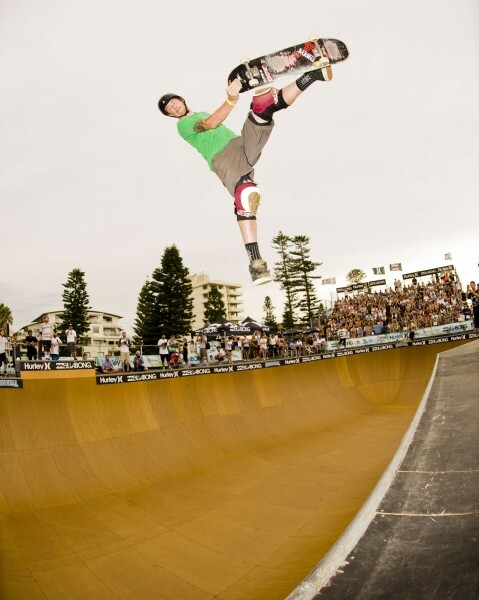 The Manly Beach Bowl (formerly the “Soul Bowl”) officially made its debut Down Under for the Australian Open. The Bowl is a custom-built marvel, created in 1999 by dave Duncan and Hans Geiger and has travelled to Brazil, England and several events in the USA. It took a full container to hold the ramp and about two months to assemble it on the Manly beach, close to Sydney Australia Australian Open! The Beach Bowl measures 3.6 meters high, 15 meters wide x 26 meters long. The kidney shaped bowl has a vert extension, a hip, and caters for hundreds of trick combinations. The surface is a plastic-infused wood called 'Skatelite', invented and designed with the perfect amount of slip and grip for skating. This bowl is designed for the creative skater to use the whole area, boosting and grinding with speed around the bowl. Today, below a scorching sun, the Masters and the Pro got their qualifications.There was a live broadcast for several hours (for those who don’t live in Sydney) and Pedro Barros killed it with tricks never seen before in the Soul Bowl: backside stalefish, kikck flip indy, 540 stalefish. He easily landed #1 of the Pro division organized by WCS (World Cup Skateboarding). Just after his qualification, Rob Sluggo posted on Facebook: "I qualified first today ! Pretty stoked to be here skating with everyone . I am a truly blessed individual ! Sending love and positive energy to everyone . Thanks for all your support . Smile !!!!!"